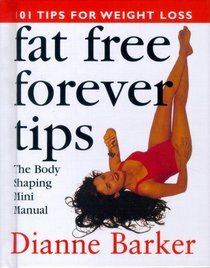 Building on the tremendous ongoing success of Di Barker's Fat Free Forever, one of the most popular diet books in recent times, we now have the 'little' pocket size book which contains 101 tips to help you lose weight and keep it off. It looks exactly like a tiny version of the bigger book so it will be very recognisable. This little books contains real information and very useful ideas for anyone wanting to shed a few extra pounds. Rather than having to wade through a whole diet book, there are tips here that can start to change the way you eat and exercise overnight. About "Fat Free Forever Tips"